Heading up to Rhode Island for today's tour, the photos for which I got in November 2016. I previously posted the photos on Flickr but we're going to take a more in-depth look here. Plus, if anyone cares, I enhanced the photos with that newfangled personal computer stuff. 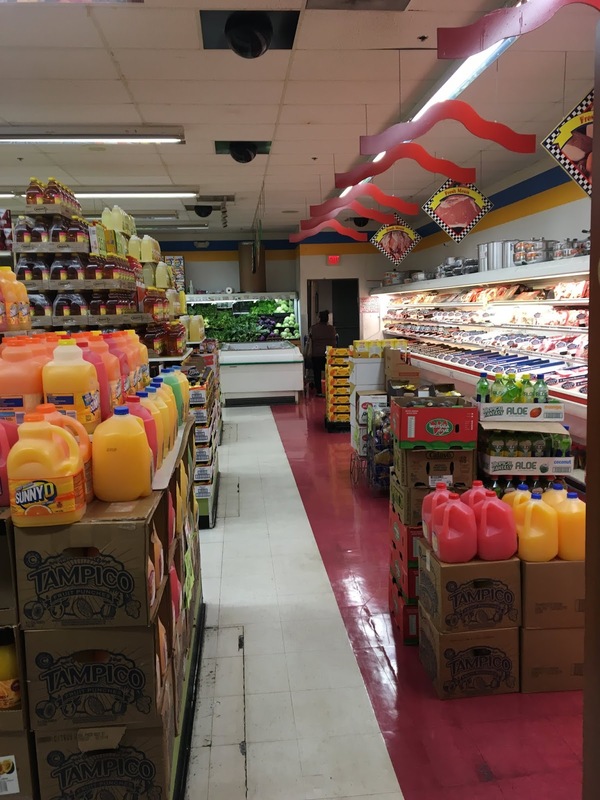 We're going to take a look around the America's Food Basket in Providence, RI. 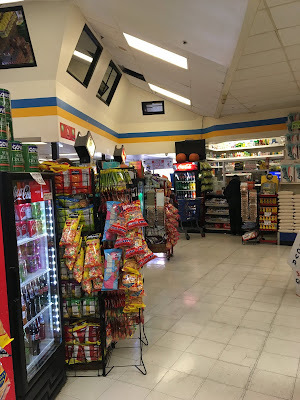 This store was previously a Compare Foods owned and operated by Aurora Grocery Group, but they sold to AFB operator Edwin Polanco (please correct me if that's not who owns this store). This store is probably around 15,000 square feet. It appears that this sign is permanent. I don't believe it's been replaced yet, and the facade has been completely repainted, although strangely enough, AFB repainted it in the Compare Foods colors. They have since painted it again, beige with green trim, which looks better. AFB has a partnership with The Family Cake, based in Warren, RI. 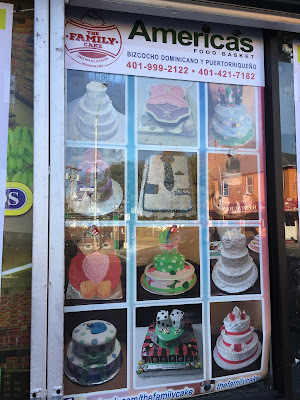 Some of their cakes are sold in the store, as we'll see inside. Also around the corner is a large, colorful awning proudly displaying the Compare Foods logo. 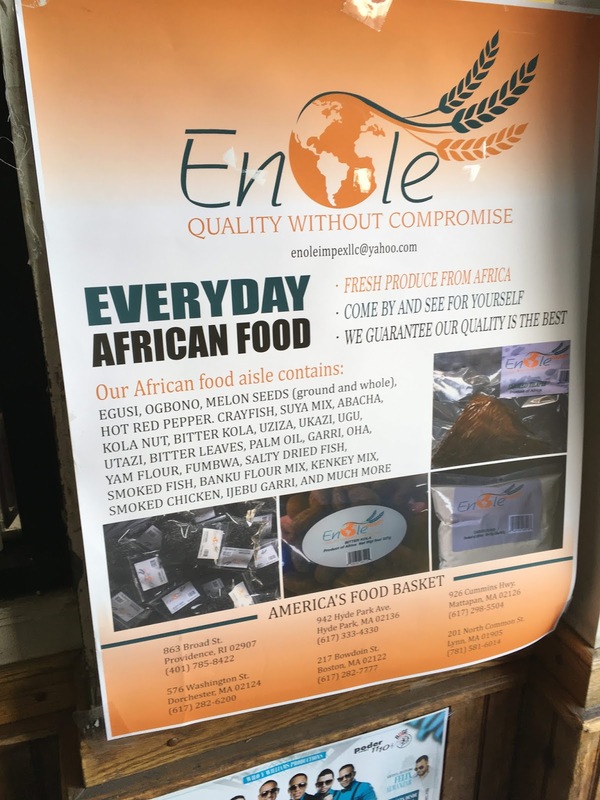 I previously pointed out that this was kind of strange, since the awning could have easily been removed like the one along the front was, or covered easily with an America's Food Basket decal. The fact that both of these remain still, to the best of my knowledge, suggests that there are more extensive exterior plans in place. At least I hope so! However, the store does have a beautiful mural running along the side wall, depicting the local neighborhood. And as much as they look like it, these were never Pathmark carts. They're just the same type (Technibilt Renaissance) and the same color. Inside the store, produce lines the first aisle with meats along the back wall and dairy/frozen at the far side of the store. Deli is along the front-end at the far corner with customer service and a few smaller storefronts that are rented out along the front-end. Walking in, you definitely get the feeling that the store's packed full with produce. The truth is, though, the produce selection isn't as large as it looks because all the cases are one- or two-tier. This is more produce than any other store in the neighborhood has, though. With, of course, a heavy emphasis on Latin produce. The decor, which looks particularly good in the first photo, is left over from Compare Foods and is still complete with its Compare Foods branding. Usually we see paper products on top of the produce cases, but here it's cereal and crackers. The first aisle, with lots of products stocked very high. Don't bump into the shelves here. There's no service butcher here, but plenty of packaged meats. You get an idea of how cramped the store can get in this photo. Some of the decor signs, such as this Fresh Meats diamond sign, are not specific to Compare Foods and work with any store banner. 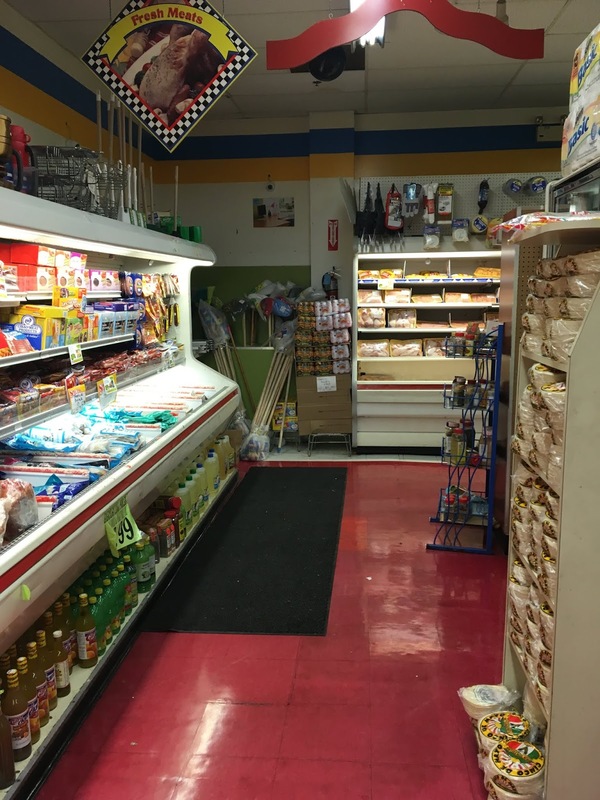 However, the color scheme is outdated, and the Compare Foods blue and yellow are still very prominent on the walls. Looking along the back wall. The store is narrow, but fairly deep. Frozen meats, dairy, and frozen foods in the last aisle. You can see the deli at the far side of the store. Even though it's small, this store does have a bakery in store. 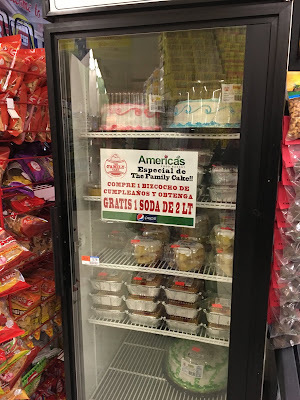 They make some traditional Latin baked goods, and some kinds of bread. Lots of selection packed into this little deli. I'm not sure what's in those brown boxes, though. Notice that the deli signs also still say Compare Foods. Next to the deli counter is this case for The Family Cake. 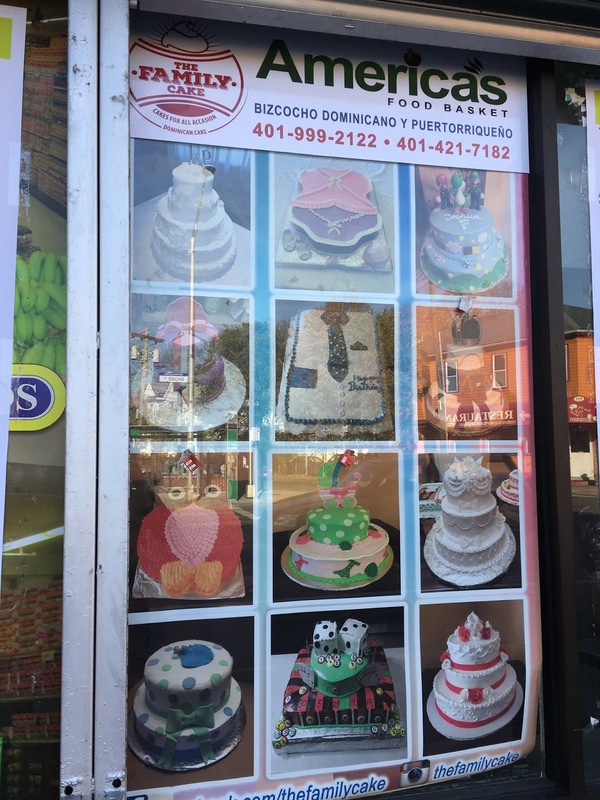 I find it slightly strange that a bakery specializing in Latin products catering to a primarily Latino customer base would choose a name in English, like The Family Cake. In fact, the name Compare was chosen because it meant the same in English and Spanish, and there were at the time no other grocery store banners that could be understood by Spanish speakers (such as Key Food or Associated). This picture makes me a little queasy. Between the angled floor and ceiling tiles and the slanting roof and walls, I'm not sure I'm on solid ground. Anyway, the entrance and exit are visible straight ahead to the left of customer service. 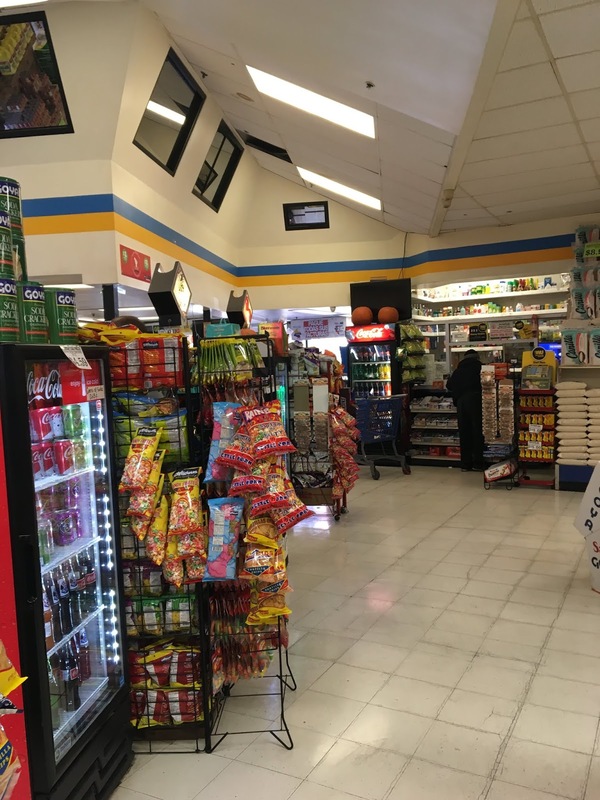 There's a cell-phone store that's rented out under the drop ceiling. 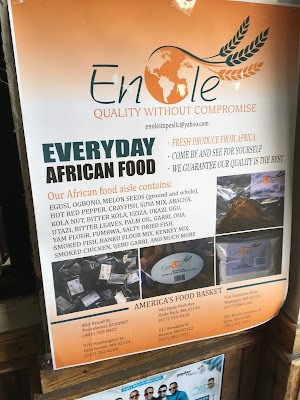 This poster caught my eye on the way out, and it appears to be a local distributor of African food -- not exactly a staple in most supermarkets! Looks like they have an agreement to sell in the regional AFB locations. It'll be interesting to keep an eye on this store and see if they do any renovations going forward. I sure hope so, but it's still clean and well-stocked otherwise.